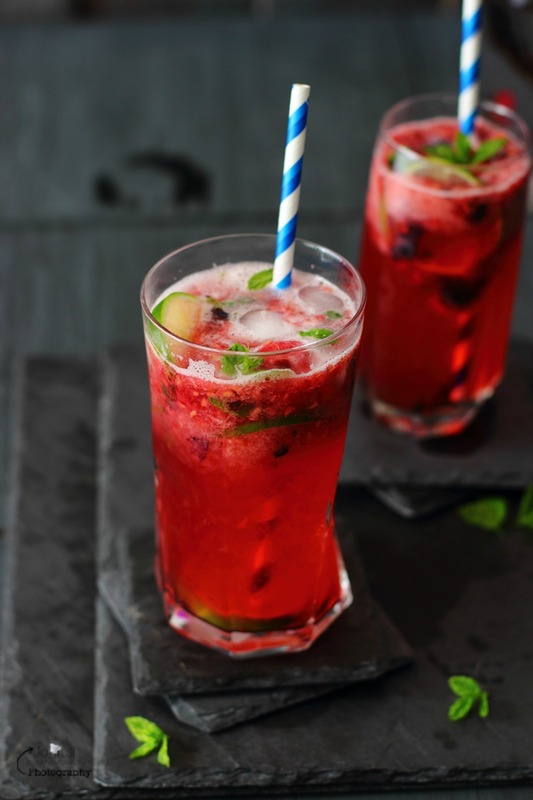 Virgin mixed berry Caipirinha is an alluring and delightfully delicious non-alcoholic drink. It makes you feel light and refreshes on warm days and it's dead easy to prepare. 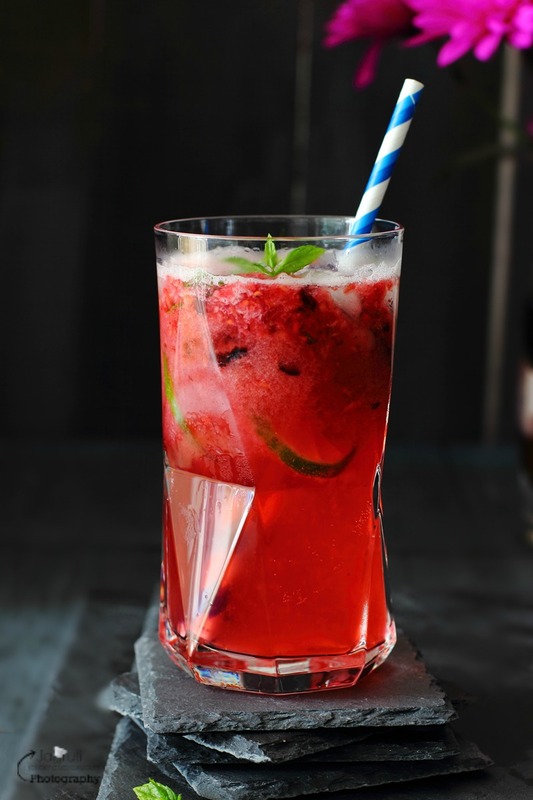 A virgin mixed berry Caipirinha is a wonderful mixture of fresh and juicy mixed berries like raspberry, strawberry and blueberry, muddled with lime and mint, bubbling with sweetness. The weather is an important influence on when and how you choose to barbecue. In my parts of the world sun is out and continuously giving us warm sunny days, so our thoughts are turning on drinking and eating alfresco. Last year we missed doing a barbecue, so this year before it's get too late as soon as the sun was out we planned a barbecue party at ours. The back garden was packed with great atmosphere, everyone was having great time with music, food and drink. For the party , we decide to prepare the food and drinks from around the world as all are ready for the intense excitement of Rio 2016 Olympics in Brazil. We prepared delicious and enticing foods and salads inspired with world cuisine and for drinks we got our evening off to a great start by with tall glasses of Brazil's most famous cocktail Caipirinha ! Classic Brazilian Caipirihna prepared with Cachace (sugarcane hard liquor) lime and sugar, but to feel summery I have used mixed berries, and to replace alcohol I used sparkling cream soda. 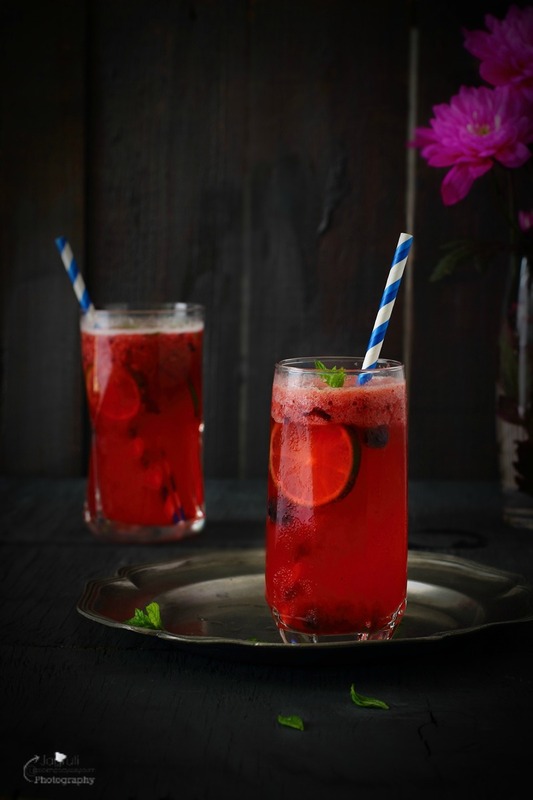 Sweet and refreshing non alcoholic drink perfect for sipping grill-side ! Notes :- Use white rum or vodka for a boozy drink. Use sparkling water if you can't get hold of cream soda. This Sweet , refreshing non alcoholic caipirinha is so delicious , let's celebrate summer ! Keep some berries aside for garnishing. Place rest of the berries into tall glasses. Add sugar, lime and mint. Using rolling pin muddle the fruit and lime. Fill the glass with the crushed ice. Add cream soda , stir to combine. 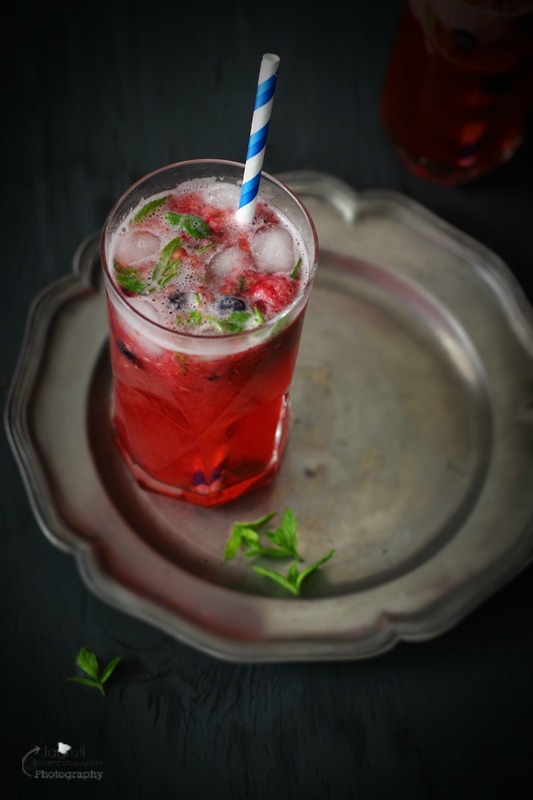 Garnish with reserved berries and mint leaves. This is my favourite cocktail, and I love that I can now have a non alcoholic version, as I am pregnant. Congratulations Dannii..yep, non alcoholic versions are good this time . Take care ! This looks so refreshing. I love your beautiful photos. Thank you Michele for lovely words. Take Care . 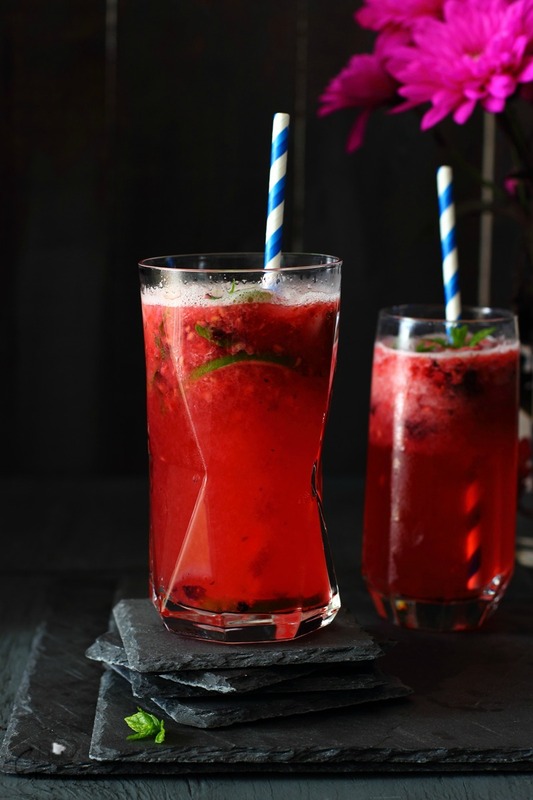 What a great refresher and a great way to use up fresh berries in the fridge. Love that this beverage is good for all ages. Looks wonderful. Such a beautiful color! The flavors sound amazing and I love that it is non-alcoholic. Very refreshing and yummy drink. Great for hot summer months! Looks so refreshing! Perfect summer drink. Absolutely love the colour of this. So refreshing! To be fair, plenty of success stories do come with alcohol. but this looks so much testy. Just looking at your photos is refreshing me already. 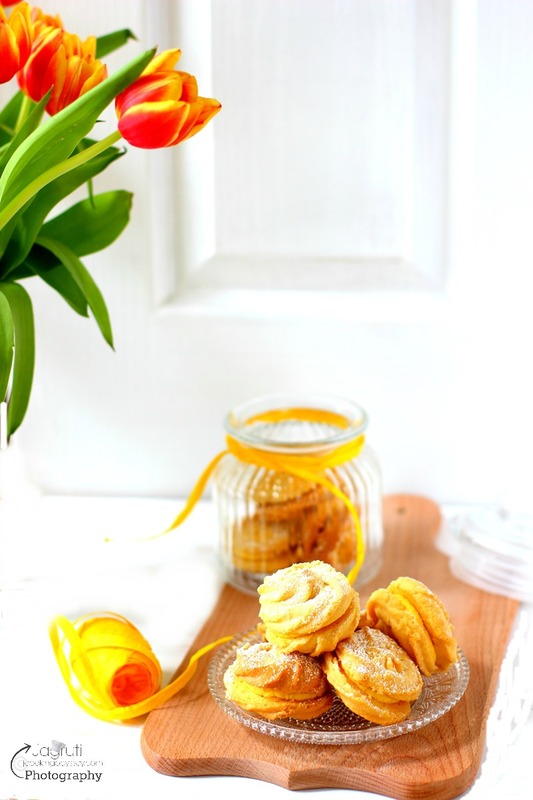 The ingredients are even better. Love berries and lime together. Pinned to my Drinks for everyday board.